Since Boko Haram attacks, in January 2015, in and around the northeastern Nigerian town of Baga, more than 18,000 Nigerian refugees have sought refuge in Chad, many of them in the small islands scattered in the Lake. 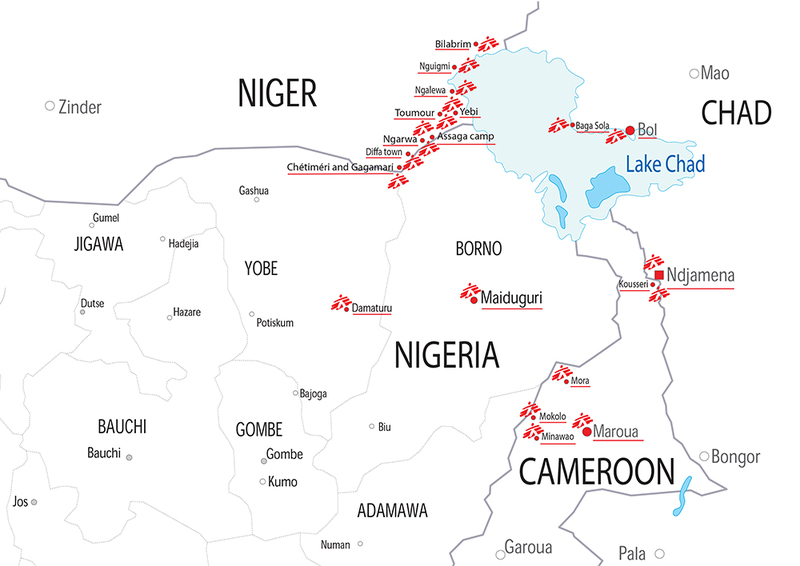 The volatile security conditions in and around the islands scattered in Lake Chad and difficult access to these areas prompted the Government of Chad to allocate the site of Dar Es Salam, located some 12 km from Bagasola, for the accommodation of Nigerian refugees. Today according to UNHCR 4,960 Nigerian refugees are accommodated in Dar Es-Salam camp but due to the lack of food available some of them choose to return to Nigeria despite Boko Haram threats. More than 2.7 million people have been forced from their homes by violence in the Lake Chad basin, which is now the site of one of the African continent’s largest humanitarian crises. The region is currently buckling under the pressure of attacks by the Islamic State’s West Africa Province group (ISWAP), also known as Boko Haram, and the military response launched to curb the violence. A conflict that originated in Nigeria has expanded across borders into Cameroon, Chad, and Niger, causing widespread displacement and suffering. Suicide bombings and lethal attacks occur on an almost daily basis, and the civilian populations in all these countries are suffering from the consequences of indiscriminate violence perpetrated by armed belligerents from all sides. Many of the displaced have found refuge with host communities, straining already limited resources. There are few functioning health facilities available and insecurity prevents people from accessing essential services. The very rhythm of life has been disrupted. States cannot deliver the services they once did, farmers cannot till their fields, and traders cannot move their goods. In response to the continued displacement and humanitarian needs, MSF is significantly scaling up its medical activities and assistance to people in the Lake Chad region. Since 2014, roughly one million people in northeastern Nigeria’s Borno state have been forced to seek refuge from violence. Most now subsist with too little food or clean water and too few health care services. In the state capital, Maiduguri, MSF teams support State Ministry of Health medical centers in Maimusari and Bolori, providing treatment for malnutrition and malaria and assisting deliveries. In 2015, some 116,260 outpatient consultations were carried out. Last September, MSF also began managing the emergency room in Maiduguri’s Umaru Shehu Hospital, where an MSF surgeon performs trauma surgery, often for people wounded in violent attacks. MSF also monitors sanitary and health conditions in 15 camps that currently house some 100,000 internally displaced people (IDPs), one-quarter of whom are believed to be children under five. In nine of these camps, MSF has trucked in clean water, drilled boreholes, constructed latrines, and installed water pipes and tanks. MSF has also been running the outpatient clinic in the Dalori 2 camp since January. In Yobe state, to the west, some 195,000 people have fled violence and have settled in host communities and four camps in the area. MSF is providing medical care in the health center in Kukarita, where teams carried out more than 4,000 consultations in just the first two months of 2016. MSF also provided 240,000 liters of water per day in the camps as well, and since February, MSF has been treating children for malnutrition in Damaturu hospital. There are currently some 61,000 refugees and 158,000 IDPs and returnees in Cameroon’s Far North region. The majority of IDPs live dispersed in host communities in areas that receive little humanitarian assistance. MSF has been providing essential health care services to displaced and local populations in the region for more than a year now, but insecurity and limited mobility hamper the delivery of aid in many locations. MSF delivers medical care and water and sanitation activities at a refugee camp in Minawao that is managed by the United Nations High Commission for Refugees (UNHCR). The camp, which has 55,000 residents, is situated in a desert-like area where water is scarce; MSF is currently providing some 55 percent of the water. Teams carried out 29,077 consultations in the camp in 2015, and some 6,861 during the first two months of 2016. MSF is also providing pediatric and nutritional care to the displaced and resident population in the towns of Mokolo and Mora. There are around 41,000 IDPs in the area but there are few functioning health care facilities. Children under five are treated at the district hospital in Kousseri, where teams also performed around 840 surgeries, including Cesarean sections, in 2015. MSF provides health care services to displaced and host communities in three villages in the vicinity of Kousseri as well. MSF continues to provide support to local health authorities to help respond to large influxes of wounded following violent attacks. On February 17, for instance, MSF treated 75 people wounded in a suicide bombing in the town of Mémé. Around 6,300 Nigerian refugees and 43,800 displaced Chadians are struggling to survive in the face of insecurity in the Lake Chad area. 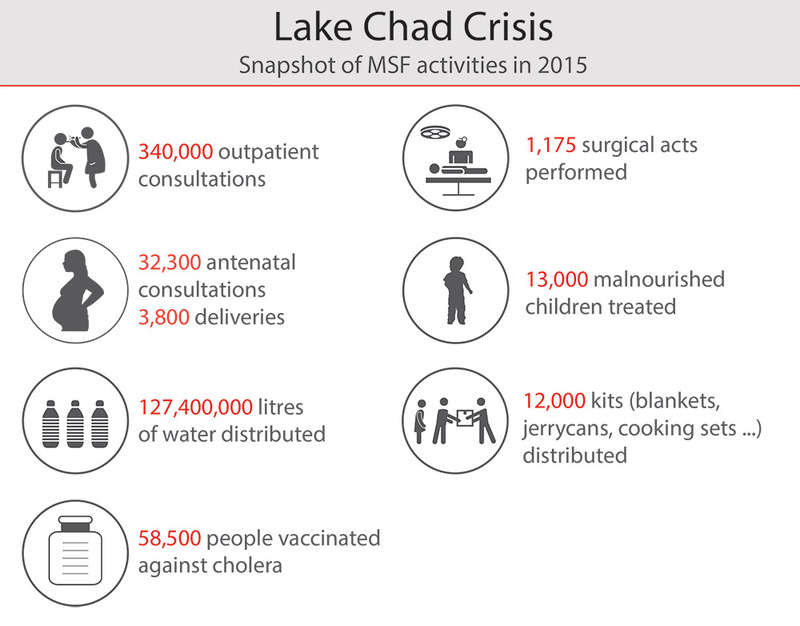 MSF has worked in the Lake area of Chad for the past year. Teams in the towns of Baga Sola and Bol run mobile clinics providing basic health care to the displaced and resident populations. In February alone, teams carried out 6,980 consultations. MSF is also supporting the health center in Tchoukoutalia. New pockets of displaced people are gathering in Djamaron, north of Liwa, around 100 kilometers [60 miles] from Baga Sola. In February, MSF launched new mobile medical activities to reach this vulnerable population. Psychologists also provide mental health care in MSF’s mobile clinics in the Dar es Salam refugee camp; in February, they carried out 136 consultations. In addition to its medical activities, MSF distributes relief items such as plastic sheeting, mosquito nets, soap, towels and blankets, and water treatment kits. Teams also supported the local hospital in Mani to treat wounded following a suicide attack on January 31. And in Bol, MSF works with local health authorities to provide maternal and child health care at the district hospital. More than 300,000 Nigerian refugees, IDPs, and returnees have sought refuge in Diffa, in southern Niger, due to continued violence in the Lake Chad area. “The already troubled situation of the population in Diffa, who are facing spikes of malnutrition and malaria, has further deteriorated due to the ongoing violence,” said MSF program manager Luis Encinas. “More and more of our patients are describing a devastating situation.” Too often, however, basic needs such as shelter, food, clean water, and access to medical care remain unmet. In Diffa town, MSF supports the main maternal and pediatric health center, providing care for children under 15. In January 2016, teams assisted with 146 deliveries. MSF is working in the district hospital in Nguigmi and in several health centers in the surrounding area. MSF also is providing medical care and water and sanitation activities in Assaga Camp, which hosts some 12,000 Nigerian refugees, and in Yebi, where some 30,000 people have sought refuge. In 2015, MSF carried out more than 142,000 medical consultations in the region. MSF teams have also conducted a measles vaccination campaign in Assaga Camp and vaccinated more than 79,000 people against cholera in the district of Bosso. Situated in the Lake Chad region, the site of Koulkimé in Chad hosts approximately 1,800 displaced people according to OCHA. They have fled Islamic State's West Africa Province (ISWAP), also known as Boko Haram, as well as military operations carried out by the Chadian government. MSF is working together with the Chadian Ministry of Health to support the primary health centre in Koulkimé.